On Tuesday 7 October 2014 we held our annual conference for academics, practitioners, educators and carers. The day provided up to date, evidence-based information on the commonly encountered barriers experienced by disabled children and their families in accessing their legal rights and practical approaches to breaking down these barriers. We’d like to thank everyone who attended and our excellent speakers for making the day a success. Videos of the presentations and speaker slides from the day can be accessed by clicking on the the speakers names below. Professor Chris Oliver (University of Birmingham): Meeting the needs of children with severe intellectual disability: From response to strategy. Professor Richard Hastings (Warwick University): Parents’ and service users’ experiences of challenging behaviour services. Dr Janet Read and Dr Claire Blackburn (Warwick Medical School): Socio-economic influences on outcomes for disabled children. Alison Thompson (Parent and author): Accessing services: the view from a parent. Dr Maggie Atkinson (Children’s Commissioner for England): ‘We want to help people see things our way’. 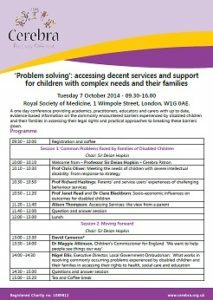 Nigel Ellis (Executive Director and Local Government Ombudsman): Commonly occurring problems experienced by disabled children and their families. Polly Sweeny (Associate solicitor, Public Law Department Irwin Mitchell): Educational, Health and Care Plans: legal rights of disabled children under the Children and Families Act 2014. Professor Luke Clements (Cardiff University Law School): Helping families to access their legal rights. Please click here to see the Question and Answer Session for the day. Irwin Mitchell Cerebra would like to thank Irwin Mitchell Solicitors who are sponsoring and supporting this event. The Big Lottery Fund Cerebra would like to say a huge thank you to the Big Lottery Fund, who have provided a grant of £9,900 towards the charity’s annual conference.